Himalaya Herbals Refreshing Fruit Pack is a cooling mask that clears clogged pores, removes deeply-embedded impurities, firms skin and helps restore its natural elasticity. It helps control blemishes and blackheads, improves skin texture and helps minimize wrinkles. Apple, a rich source of natural Alpha Hydroxy Acids (AHAs), nourishes and improves skin glow. Fig and Cucumber provide a cooling effect to your skin. Papaya helps remove freckles and smoothens the skin. Mineral Clay soothes the skin and improves circulation, leaving your skin rejuvenated and glowing. 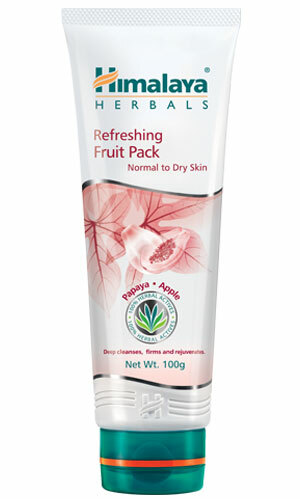 Apply Himalaya Herbals Refreshing Fruit Pack evenly over cleansed face and neck, avoiding the area around the eyes. Allow it to dry for 10-15 minutes. Remove with a wet sponge and wash the skin with cool water. Use once or twice a week. Do not apply on broken or inflamed skin.